Our ranges of Cosmetic Items are made from fine grade materials which are Easy to apply and use full for a woman person to make herself look beautiful. These products include lip sticks, glosses, eye shadow, eye and lip liners, foundation cream, and brushes to apply them evenly on the face. These cosmetic items add beauty to the face charm. We are instrumental in offering supreme quality range of Double Ended Brushes to the esteemed clients. 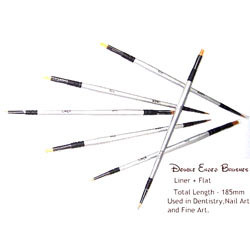 These brushes are made available to the clients in varied sizes, thicknesses and other specifications to meet their specific needs in the best possible manner. We are a trustworthy company of the industry, engaged in Manufacturing, Supplying and Exporting supreme quality Hip Hop Instant Make-Up Remover Pads. The offered make-up remover pads are one step cleansing treatment specially designed to remove face and eye make-up and gently moisturize the skin. 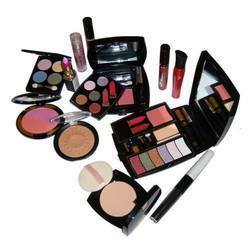 We are engaged in offering a huge array of Cosmetics Accessories to our customers. We offer these at market leading rates. - Specially formulated gel with Micro-sponge technology to help absorb excess oil and leave long lasting smooth finish. - This scrub based cream removes dirt, grime, without harming your natural skin moisture. - The fruit extracts of this scrub cream also remove the age cells and tan effectively, smooth the skin texture and improve the skin tone giving it a radiant glow. minimise acne-formation by moisturising and calming the skin.